DAR ES SALAAM — President Barack Obama ended his Africa trip Tuesday, voicing confidence in Africa’s future with help from a new U.S. model for development assistance. In Tanzania, Obama and former president George W. Bush marked the 1998 al-Qaida terrorist bombing. Coordinated truck bomb attacks on the U.S. embassies in Dar es Salaam, and Nairobi, Kenya on August 7, 1998 left 224 people dead. Just over three years later, al-Qaida attacked the United States directly on home soil on September 11, 2001. Obama’s Africa trip has been focused primarily on enhancing trade and investment in the continent, based on a new model of aid, public-private partnerships with African governments and reforms. “I know there’s a lot of talk of America’s military presence in Africa. But if you look at what we’re actually doing, time and again, we’re putting muscle behind African efforts,” he said. “That is what all our efforts are going to be about, is making sure that Africans have the tools to create a better life for their people and that the United States is a partner in that process. It’s going to good for Africa, it’s going to be good for the United States and it’s going to be good for the world,” he said. He held up South Africa’s democratic transition and progress against HIV/AIDS as a model for Africa, met family members of critically ill former president Nelson Mandela, and underscored the role of Africa’s youth in building the future. DAR ES SALAAM — In Tanzania, President Barack Obama and President Jakaya Kikwete have discussed plans to step up economic engagement with the continent and a “new model” for U.S. assistance. 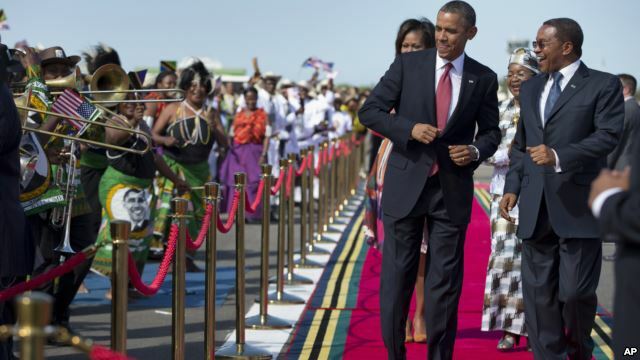 The Obamas received a warm airport welcome from the president and his wife, complete with a marching band, and women dressed in traditional “khanga” skirts bearing Obama’s picture. In a news conference after bilateral talks, both leaders took questions about the development, trade and investment agenda of Obama’s trip. Obama reiterated a key objective of his new model for engagement. “I have said this throughout Africa. We are looking at a new model that is based not just on aid and assistance, but on trade and partnership,” he said. President Kikwete thanked President Obama for “invaluable” support in Tanzania’s development efforts, from education to food security and HIV/AIDS prevention. “The lives of the people of Tanzania are different today thanks in many ways to the support we have been getting from the United States of America,” said President Kikwete. Obama noted Kikwete was the first African leader welcomed to the White House after Obama took office. Obama also noted that his visit to Tanzania came just ahead of the 50th anniversary of the late President John F. Kennedy welcoming President Julius Nyerere to the White House on July 15, 1963. Obama called Tanzania a close partner with the United States on major development initiatives, and lauded Tanzanians for democratic progress. “Tanzanians continue to work to strengthen their democracy. Parliament, opposition groups, civil society groups and journalists are all doing their part to advance the good governance and transparency on which democracy and transparency depend,” he said. The two leaders also discussed African conflicts, including the one in the Democratic Republic of Congo. Obama said all parties need to implement commitments under a recently-signed U.N. Framework for Peace. Obama said the peace framework has to be more than just a piece of paper and countries surrounding Congo need to step up. As Obama arrived, the White House announced he had signed an executive order to provide $10 million to sub-Saharan countries to help them combat trafficking in wildlife. Tanzania and other countries are highly dependent on wildlife tourism. U.S. officials noted that rhinos and elephants are particularly threatened by poachers, who are motivated by high prices for horns and tusks in an illegal trade worth at least $7 billion per year. On Tuesday, Obama and former U.S. president George W. Bush, who is also visiting Tanzania, participate in a wreath-laying event at the site of the al-Qaida U.S. embassy bombing in 1998. Obama used a response to a question on the appearance by reiterating praise for the anti-AIDS program PEPFAR that Bush initiated. “I am looking forward to being able, on African soil, to once again thank him on behalf of the American people, for showing how American generosity and foresight could end up making a real difference in people’s lives,” said Obama. Meanwhile, first lady Michelle Obama and her predecessor Laura Bush will participate in a First Ladies Summit in Dar es Salaam about empowering women in Africa. CAPE TOWN, SOUTH AFRICA — President Barack Obama has outlined a new model for U.S. engagement with Africa, supporting greater economic opportunity and democracy, and African-led solutions to security. At the University of Cape Town, Mr. Obama presented a broad picture of his goals for U.S.-Africa policy, including assistance, trade and investment, health, and security cooperation. The speech was framed around the legacy Obama said former president Nelson Mandela has left for the continent. 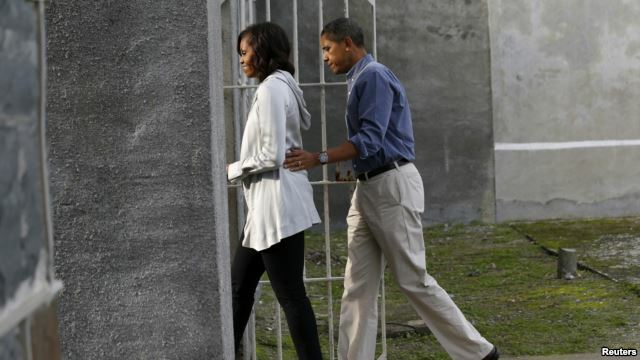 ​Earlier he and his family visited Robben Island, where Mandela spent nearly two decades of his 27 years in prison under the former apartheid regime. “Nelson Mandela showed us that one man’s courage can move the world and he calls on his to make choices that reflect not our fears, but our hopes, in our own lives and in the lives of our communities and our countries,” he said. Obama said the United States will “up our game” in a continent he described as “poised to take off,” with new trade and investment and steps to bring down trade barriers. He spoke about his food security initiative to help lift 50-million people out of poverty within a decade. And he announced a “Power Africa” initiative to double access to power in sub-Saharan Africa, with an initial investment of $7 billion. Obama said he will continue seeking ideas from Africa’s young people about their continent’s future. He announced his plan to hold a first-ever summit in Washington of sub-Saharan African leaders. “I am proud to announce that next year, I am going to invite heads of state from across sub-Saharan Africa to a summit in the United States to help launch a new chapter in U.S.-Africa relations,” he said. The president spoke of a “historic shift” in Africa from poverty to a growing middle class with fewer people dying of preventable disease, but still threatened by the “rot of corruption” and conflict. “It is not moving fast enough for the child still languishing in poverty in forgotten townships. It is not moving fast enough for the protester who is beaten in Harare, or the woman who is raped in Eastern Congo. We have got more work to do because these Africans must not be left behind,” he said. Citing free and fair elections and the growth of civil society from Ghana to Zambia, he said governments that respect the rights of their citizens and abide by the rule of law do better and draw more investment. In Zimbabwe, he said only a credible election can help repair the country’s economy. “There is an opportunity to move forward, but only if there is an election that is free and fair and peaceful so that Zimbabweans can determine their future without fear of intimidation and retribution. And after elections there must be respect for the universal rights upon which democracy depends,” he said. Obama said the United States is interested in investing not in “strong men, but in strong institutions” and supports open and accountable governments, independent judiciaries, and societies that empower women. “No country will reach its potential unless it draws on the talents of our mothers and our sisters and our daughters,” he said. Obama said opportunity and democracy cannot take root as long as fear prevails in too many places, citing conflicts in Mali, Somalia, Congo and Sudan. He said the United States supports African-led solutions, noting U.S. support for African Union peacekeeping in Somalia and efforts against the rebel Lord’s Resistance Army in central Africa. “From Mali to Mogadishu, senseless terrorism all too often perverts the meaning of Islam one of the world’s great religions and takes the lives of countless innocent Africans. From Congo to Sudan, conflicts fester robbing men and women and children of the lives they deserve. In too many countries the actions of thugs, and warlords and drug cartels and human traffickers hold back the promise of Africa, enslaving others for their own purposes,” he said. He said America makes no apology for helping African efforts to end conflict and stand up for human dignity. Earlier, Obama joined retired Archbishop Desmond Tutu at a youth center named after him for AIDS prevention. “Your success is our success. Your failure, whether you like it or not, is our failure. And so we want to assure you that we pray for you to be a great success. We want you to be known as having brought peace to the world,” said Tutu. President Obama and his family depart early Monday for Tanzania, the final stop on his three-nation Africa tour.